Op shop finds. Lemons @ 10c each. Don't go to the supermarket to buy your lemons, head to your nearest opportunity shop! Yummy recipes for lemons; lemon cookie thins, lemon ricotta muffins, garlic chickpeas with feta and lemon, lemon-garlic kale pasta. Eco-bit: Natural Brightening. "After a few washes, clothes can become a little dingy. This is because soap builds up and gets trapped in the fabric. Bleach is one solution for lighter colors, but bleach is a highly toxic substance that can take centuries to decompose. There are better eco-options available when it comes to buying bleach, but the best thing to do is to avoid using it at all. As an alternative, try letting the sun do the whitening for you. 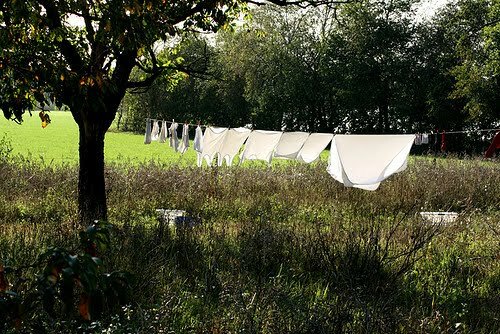 Add one-half cup of lemon juice to your wash and hang it up to dry outside. When mixed with the heat of the sun, the lemon juice acts as a natural bleach"
I am curious to know, are lemons only found in Australian op shops? Do thrift stores in the USA, charity shops in the UK, or thrift shops in Singapore sell lemons? Tell me if your thrift shops sells lemons! 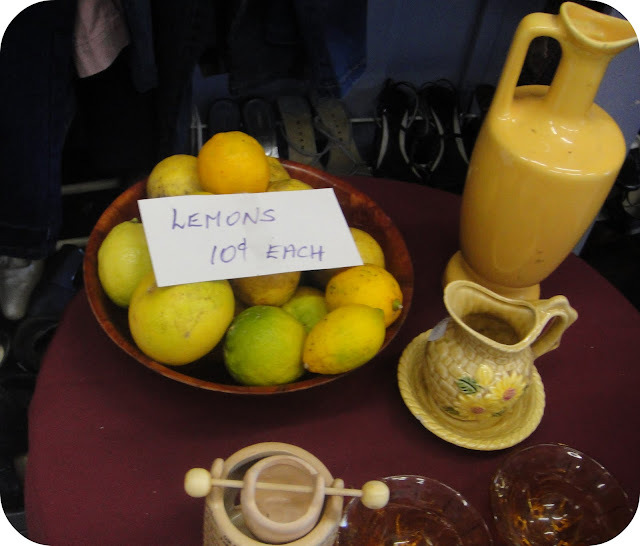 we saw lemons for sale in a small church op shop in geelong yesterday! this is awesome! i had no idea lemons could be bought from op shops. i buy loads of them at the farmers market, might as well save an extra few bucks and get them here. thanks for the tip! I too, am a fan of the op shop lemon. Food miles are minimal. In country towns, the lemon trees are usually ancient that have little or no need for chemicals and usually fertilized with local horse or cow manure. You cannot beat the op shop lemon! I have never, ever seen any kind of food for sale in a thrift shop in the US. Why do so many shops sell lemons in AU? Hey @practical parsimony, as @redwitch says, due to many Australians often having lemon trees in their backyards, is why so many end up in op shops. Quite often the volunteers that spare their time are the ones that donate lemons, otherwise local people do. par contre, this morning! cherries on a stall in the brocante. what a great little post. Aren't lemons such fabulously useful things. I have planted two trees..can't bear to be without them. 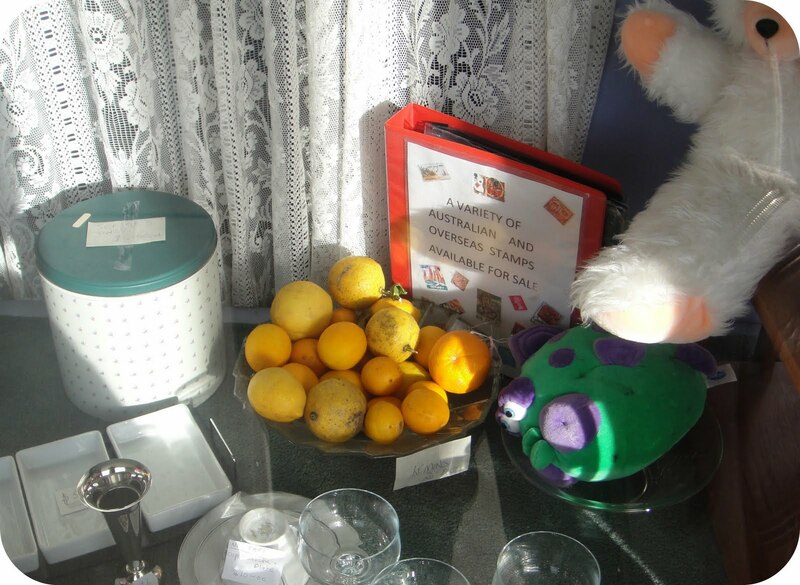 Yip, we have op shop lemons here from time to time..marvelous idea. Oldies tend to bring them in..sort of a tradition like making jam for Church fairs. no lemons at our thrift shops but definitely a good tip, heard it somewhere but forgot about it. Thanks for sharing! I wish charity shops in the UK sold fresh produce! Unfortunately I've never seen any signs of lemons over here! Yes my locals do, and aren't they the sweetest ones with the most flavour too! From real gardens and no spray. I didn't know you could put lemon juice in the washing machine. I use vinegar as a rinse so I guess it is kinda the same thing. I put half washing powder and half carb soda in the soap dispensor and the soda reacts with the vinegar to get the cleanest wash ever. I run an op shop in Bendigo called View Hill Bargain Shop and we just give our lemons away for free!